Adam's inner-monologue is extremely repetitive and we find ourselves reading the same content over and over and over again...he's on and off again with his girlfriend Gracie, and there's some strange homosexual undertones with Jamie. The plot seems to stand still -- and I'm not quite sure what message Barzak is trying to send when describing the homosexual feelings between Adam and Jamie. Is this all part of the "teenager-trying-to-discover-his- identity-and-place-in-life" ploy? Either way, it's not very coming-of-age and not very original; just plain weird. 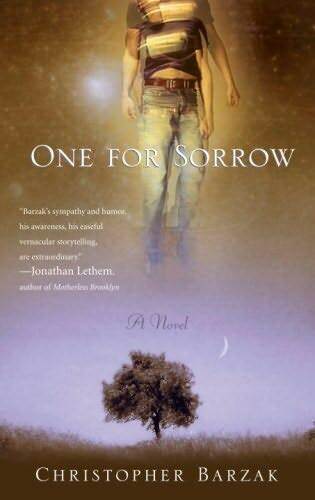 One For Sorrow is dark and troubled, as we learn what Adam has in common with Jamie. Adam is your typical troubled, "emo" teen who contemplates suicide as Jamie challenges Adam's purpose in life throughout the novel. When Adam is finally liberated, I'm not so sure we feel triumphant, but rather glad the novel is not another example of pathetic teenage tragedy. Since One For Sorrow was published, Christopher Barzak has written The Love We Share Without Knowing (2008). If you like plots along the lines of Alice Sebold 's The Lovely Bones , perhaps you will enjoy One For Sorrow as well.